Salahi’s Garden & What’s Inevitable. 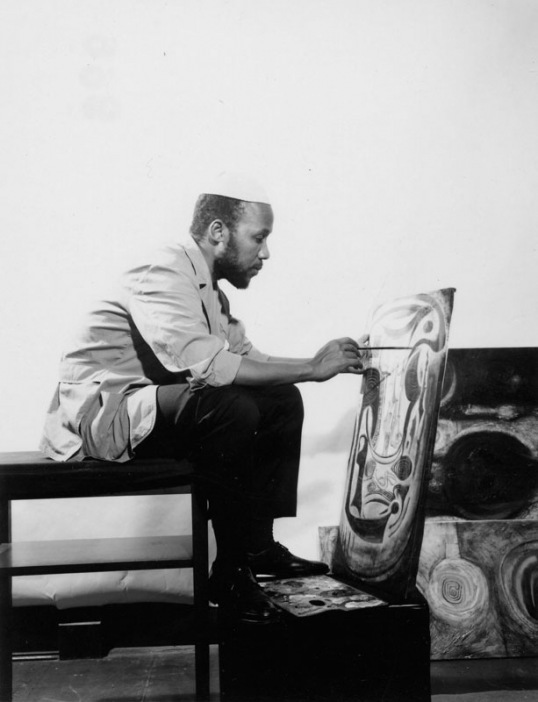 Ibrahim El-Salahi is a Sudanese artist, an important figure in African and Arab modernism. El-Salahi is considered a pioneer in Sudanese art and was a member of the Khartoum School that was founded by Osman Waqialla. Hassan Musa writes about El-Salahi (he first heard stories about him when he was a teenage boy): “I was fascinated by the idea that an ordinary Muslim man could live as an artist, because in my imagination they were unreal creatures who came out of European literature”. El-Salahi’s international success soon turned him into a national hero, so much so that in 1970 the Department of Tourism distributed a poster in which El-Salahi posed in his studio, with the caption “Sudanese artist at work”. 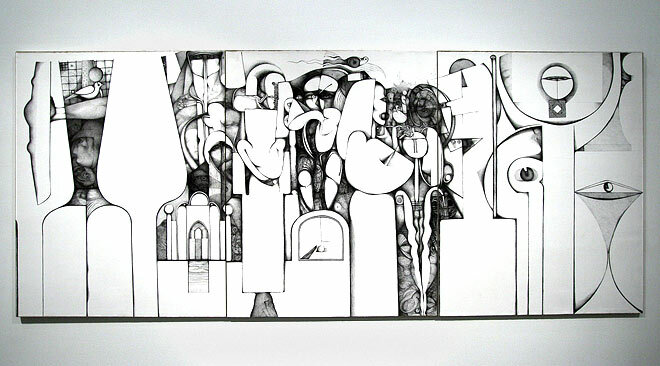 El-Salahi developed his own style and was one of the first artists to elaborate the Arabic calligraphy in his paintings. He developed an iconography from sources in primitive and Muslim art, leading to the formation of the Khartoum School. He was an assistant cultural attaché at the Sudanese Embassy in London from 1969 to 1972, when he returned to Sudan and became Undersecretary in the Ministry of Culture and Information until September 1975. At that time he was imprisoned without charge for six months. “For the first few weeks of detention, we claimed Freedom and Respect according to the Universal Declaration of Human Rights. Then, because the prison food was tasteless, we asked for a few onions. “In The Inevitable, eyes are either shaded-out into black voids, or are averted from the viewer. Only a soldier keeps a sideways watch on us. The picture is machine-like, sharp and cold. For there is a demand and a prayer made in each of El Salahi’s designs, and in this picture the questions posed are the same, but here the responsibility is even greater: who will dare to look at this? Who will dare to do something to avoid The Inevitable?”. 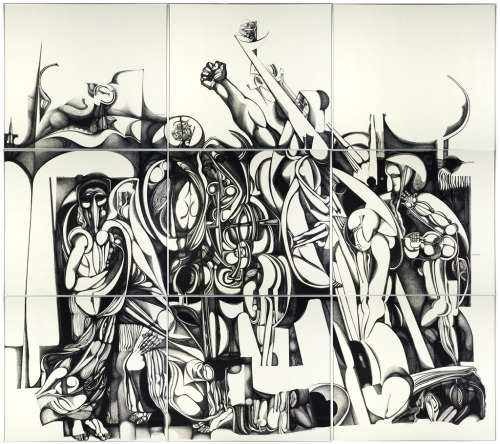 In the summer of 2013 a major retrospective show of El-Salahi’s work was mounted at Tate Modern – it was Tate’s first retrospective dedicated to an African artist. → The Book To Read: In The Country Of Men. ← eL Seed & Perception In Cairo’s Garbage City. Reblogged this on Zahra's Blog. Thanks for sharing. Two years ago i managed to visit the Tate Modern – and Elsalahi Masterpieces were at exhibit.